I'm always on the hunt for new exercises. Have you got a new exercise ball exercise that you can share with the rest of us or one that you particularly like? Have you got balls? A wiki is a website that allows users to add and edit its contents. I attempted to create a wiki page here to allow users of this site to share ball exercises. When I go to the gym I see people doing new exercises everyday and I'm always amazed that there are still so many new ones out there. I'd like readers to submit their favourite exercise ball exercises. Create your own web page in the process with a ball exercise of your choosing. Describe it to us and include a picture if you have one. If you have a particular routine or exercise ball workout then share it with the rest of us. When your submission is accepted, your entry goes "live" on this site. You will have your own web page dedicated to your exercises. Share this URL with family and friends. Post it on Facebook. 2. Give us a description of your swiss ball exercise, important points to consider during the exercise, how long you hold it, how many repetitions you normally do when you're just starting out. How many you do when you become more advanced, etc. Tell us why you like this new exercise. 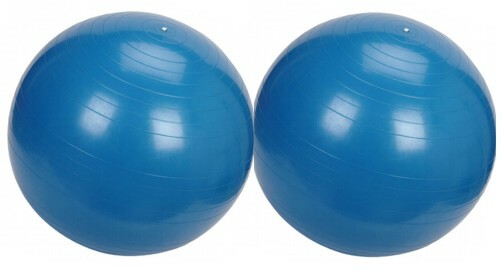 Read about other stability ball exercises submitted, comment on them, and rate them. If you have an exercise ball video you can share it here on "Ball Tube". Have you got a good exercise ball exercise that you can share? Have you got balls? This is an area I'd like readers to upload their favourite exercise ball exercises. Create your own web page with an exercise ball exercise. Describe it to us and include a picture if you have one. Click below to see other exercise ball exercises from visitors to this page. Feel free to comment on them and rate them.